Day of the Dead in Mexico is more than a one-day event. It’s a week-long, or even month-long, cultural tradition. Beginning in mid-October and continuing through to November 2nd, communities across Mexico prepare to welcome the souls of the departed with special Day of the Dead festivals, traditions and displays. Day of the Dead or Dia de los Muertos is an extra special time to be in Mexico. The Aztecs believed the fragrance of marigolds could awaken the souls of the dead and guide them to earth. 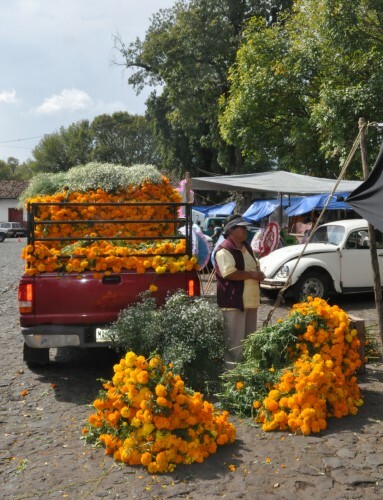 For the Purepecha, marigolds represent celebration, life and joy and, when used in abundance, their scent purifies a space. 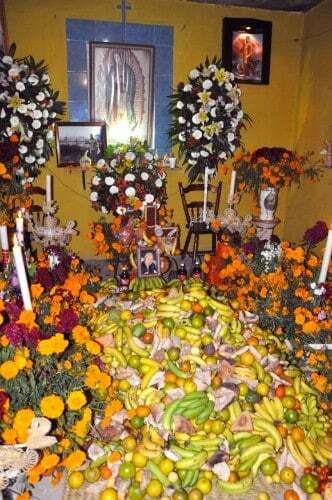 These beliefs have continued to modern times, so you can expect to see people carrying armloads of marigolds, cempasuchil in Nahuatl and tiringuini in Purepecha, to lay as pathways to their doorways to guide the spirits indoors or as part of home altars for purification. 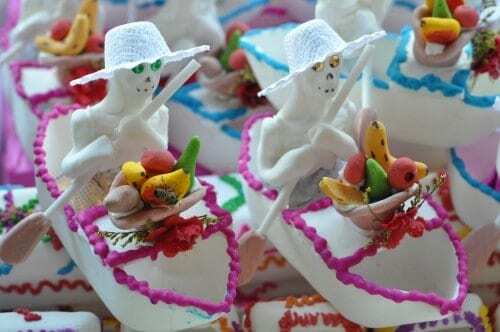 During Day of the Dead in Mexico you can browse elaborate displays of dulces for sale in market stands where you’ll discover these sugary creations in the shapes of skulls, coffins and humorous figurines intended to appeal to the tastes of the departed. I tried eating a few of these pretty treats but don’t recommend you try it unless you want to break a tooth or are truly desperate for something sweet. Day of the Dead is also the time to purchase Pan de Muerto, the sweet bread redolent with anise, or to place an order for tamales. In the days leading up to All Saints Day, families, hotels, restaurants and other businesses begin constructing altars or ofrendas commemorating family members. You’ll see spectacular constructions with photos of the departed, copal incense, marigolds, sugar candies, fruit, new clothing and momentos of the departed’s favourite activities ( ie toys, a soccer ball or even a bottle of Johnny Walker). Banners of papel picado, the intricate lacy cut-outs of flowers, skeletons or fruit, adorn doorways everywhere. Expect to see the elegant figures of female skeletons in many different forms for Day of the Dead. She’ll appear in costume, represented in coloured sawdust adorning a walkway, as a work of art in a clay statue in Patzcuaro and in shop displays throughout Mexico. Originally created by Jose Guadalupe Posada to satirize people who abandoned their Mexican heritage and assumed the attire of European aristocracy, catrinas have grown to become a symbol for Dia de los Muertos itself. In the days leading up to November 2nd, do as the locals do and join in public celebrations, tour exhibitions of artwork or watch folk dance performances. 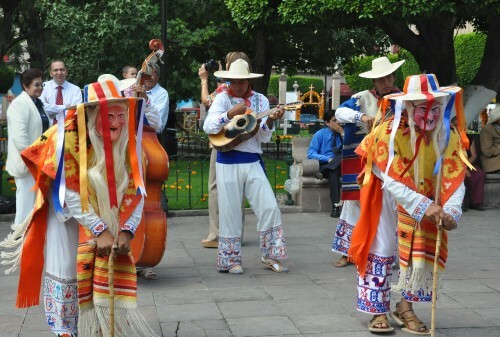 Top spots to experience Day of the Dead traditions in Michoacan include the Tianguis Artesenal at the Plaza Vasco de Quiroga in Patzcuaro, ritual tournaments featuring a flaming ball of fire in Santa Fe de La Laguna, Day of the Dead processions in Patzcuaro and cultural performances in Morelia’s main plaza. Face paint is an important ritual if you’re participating in Day of the Dead festivities. 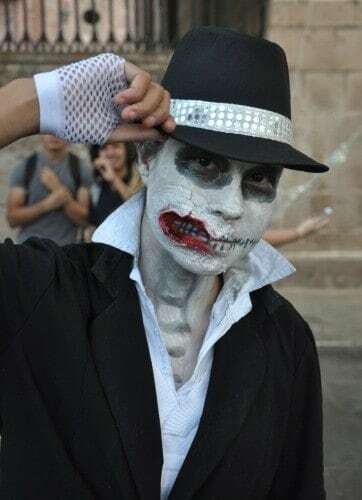 The most popular style is to create a Dia de los Muertos sugar-skull look which involves a white base and ghoulish black mouth paint but other even more imaginative versions can be seen on the streets of Oaxaca City and Morelia in particular. 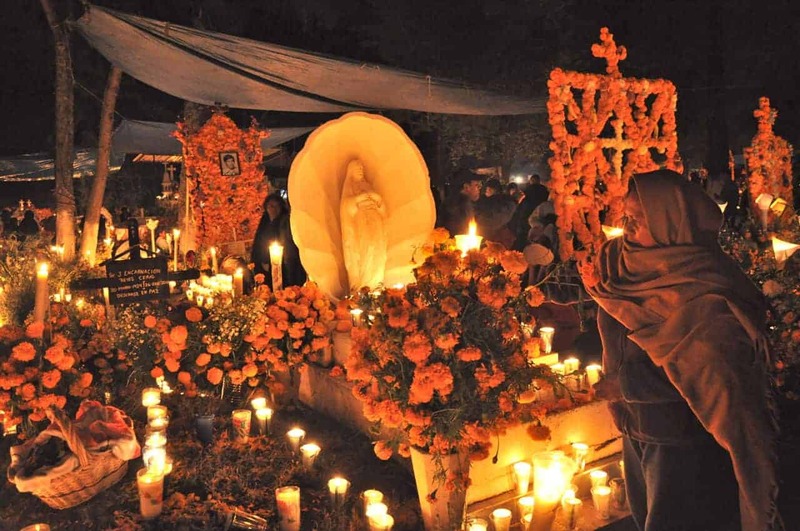 Families begin cleaning and preparing gravesites with candles, marigolds, sugar skull candies, photographs of the deceased and extravagant offerings for the all-night vigils that will take place on November 1 and 2nd. The largest celebrations are for the deceased who passed in the preceding year and who are returning for the first time. Vigils begin first for the souls of the angels ( children and the unmarried who have passed) followed by elders. In Michoacan, the cemetery in Tzintzuntzan and its associated night market is my top choice to visit. Music is another key ingredient of Day of the Dead festivities. In Oaxaca City, it’s possible to see mariachi bands, concerts with live rock bands and dramatic stage performances of contemporary and traditional dance. I was fortunate to see Alejandra Robles, ” La Morena” an amazing traditional singer who was born in Puerto Escondido perform “La Llorona” a song that tells the legend of a woman who drowned her children to be with her lover and now roams the world searching for them and crying for her loss. When it comes to traditional Day of the Dead mariachi music, the song La Llorona is undoubtedly the most popular song for Dia de los Muertos. There are several versions of La Llorona including the version by Mariachi Juvenil de Tecalitlan & Lila Downs seen in the movies “Frida” but another of my favourites is the version by Mariachi LOS DORADOS shown above. Check out our complete list of the best mariachi songs for parties, for dancing and other special occasions. The most popular food to eat during Day of the Dead or Dia de los Muertos in Mexico is pan de muerto, an anise and orange-scented egg bread that is shaped into a skull and crossbones form. In Oaxaca City and Pazcuaro, in the days leading up to November 2nd, it’s possible to purchase pan de muertos bread at the market and from vendors who have set up stalls around town. It’s also possible to make Pan de Muerto yourself ( here’s a recipe on Epicurious) …it’s delicious dunked into a steaming mug of hot Mexican chocolate. 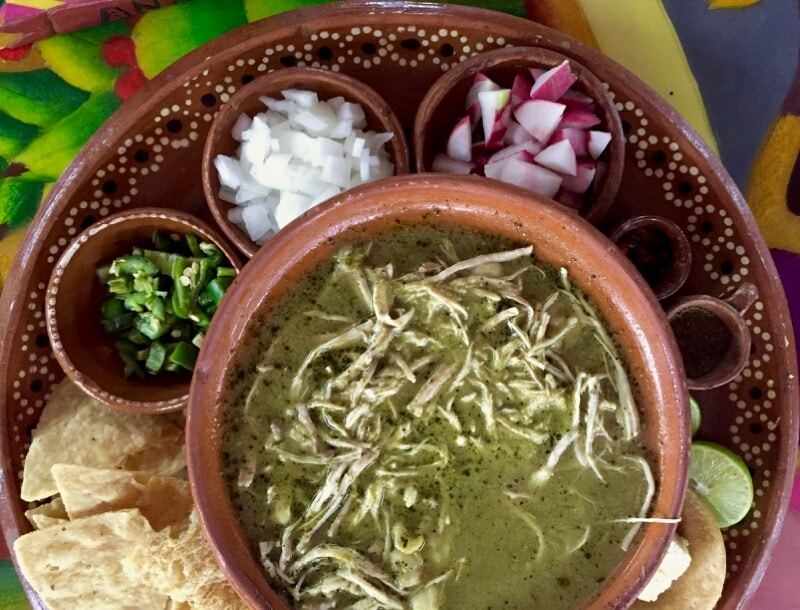 In addition to pan de muerto, other popular Dia de los Muertos or Day of the Dead food to eat include pozole, a pork and hominy stew ideal for warming up with during chilly gravesite vigils. It also does double duty in terms of serving a crowd. Regional variations of popular dishes for Day of the Day include moles and tamales accompanied by atole (a hot corn and masa drink). Portions of each of these dishes would also be presented at the ancestral gravesite as well as on the altars within the home. It’s quite common to see bottles of Johnnie Walker scotch, tequila or local mezcal on altars as well as at cemeteries. In the Patzcuaro Lake Region of Michoacan, several unique Day of the Dead traditions and special events begin on November the 1st All Saints Day and November 2nd All Souls Day. 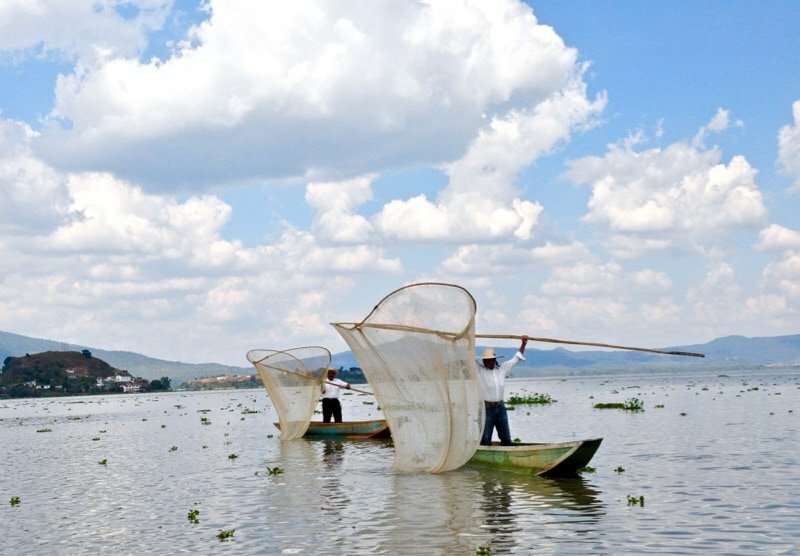 In addition to fire dances and an illuminated display by the fishermen using their nets at night, there is live music, special dinners and open air bars set up in the towns surrounding Lake Patzcuaro. Oaxaca City: Expect all-night vigils, big parties and tours in Oaxaca City, one of the most spectacular destinations to experience authentic Day of the Dead traditions and activities. Read more at Cemetery Tripping in Oaxaca City. Puerto Escondido: Local culture and tourism expert Gina Machorro often leads Day of the Dead traditions and experiences on November 2nd. To participate, reserve in advance at the information booth in front of Hotel Rocamar on the Adoquin. Gina is generally at the booth between 10:00–2:00 and 4:00 to 6:00. There is a cost to participate. Bringing cameras and taking photos is acceptable but the objective is to enjoy this cultural ritual and pay respect to the deceased. Tamales, pan de muerto and special chocolate will be available. 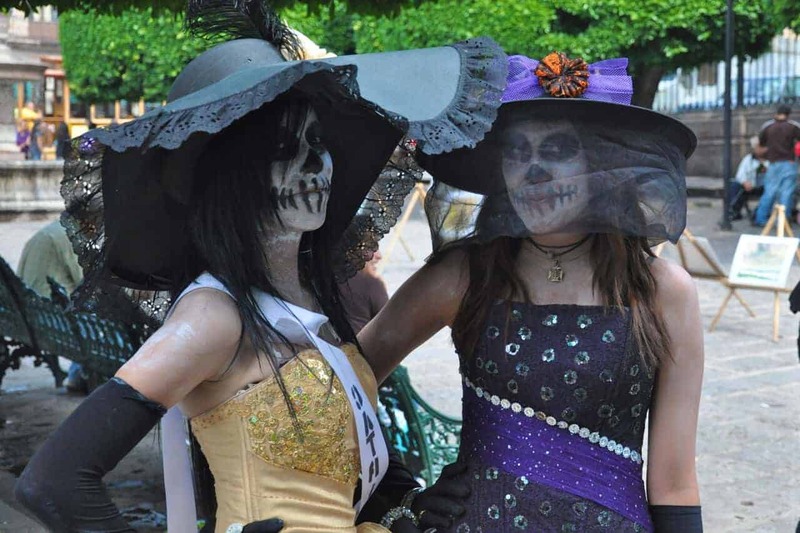 Get more details at Celebrating Day of the Dead in Puerto Escondido. Morelia: In larger cities such as Morelia in Michoacan, you can purchase a Noche de Muertos ticket in advance from vendors and tour operators such as Casa Maya near the Cathedral and Plaza Morelia. Expect to pay around $50 USD. The tours depart at 9 pm, visiting towns around Lake Patzcuaro and return at 4:30 am. Bring a small bag of fruit, coins or sweets so if you visit a family home you’ll have something to contribute to the altar. Dress warmly with a hat, gloves and jacket as you’ll be out all night and the temperature is chilly in high altitudes. Also be sure to bring a big appetite as you’ll be offered bowls of hearty pozole, the hominy stew, tamales and bread throughout the night. Get more information at Michoacan Tourism Their office is located Av. Tata Vasco #80 Col Vasco de Quiroga, Morelia. Argh. It’s killing me (pun intended) to not be there. Full report please!! I had my first experience of Dia de los Muertos in Puerto Vallarta this year and I was struck by the beauty of this celebration. Rather than be a sad and morbid affair as the name could imply it was truly a celebration in memory of departed loved ones. It was fun looking at all of the memorials set up around town. Some were really humorous like the shrine that was filled with bottles of tequila and Jack Daniels…obviously favorites of the departed. How interesting! I had no idea Day of the Dead was a week long or that there were so many festivities. Great article and photos!! Fascinating information on Day of the Dead celebrations. Not knowing much about it other than seeing some of the macabre souvenir figures, it seemed somewhat creepy. It actually sounds like a rich and meaningful, at times playful, experience. I found the information on Day of the Dead celebrations fascinating. I don’t know much about the festival other than seeing the macabre souvenir figurines. It looks like a moving (and at times fun) celebration. We were in the Yucatan area of Mexico a couple of years ago during the end of October and had a great time spotting the catrinas in various shops -so imaginative! 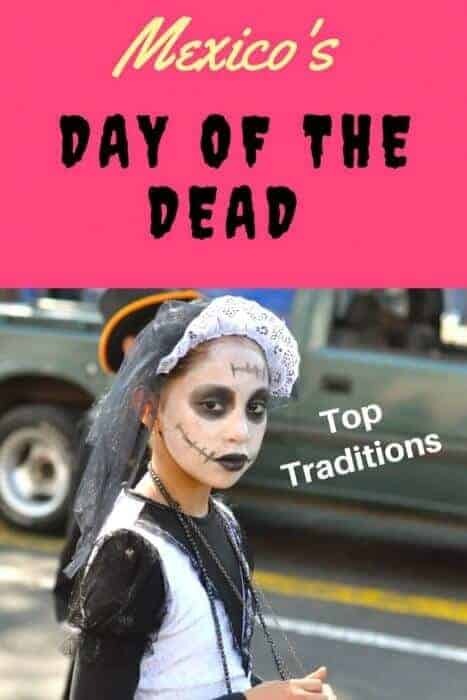 I love the idea of celebrating the lives of deceased loved ones as well as long-dead ancestors and making the rituals fun rather than somber. 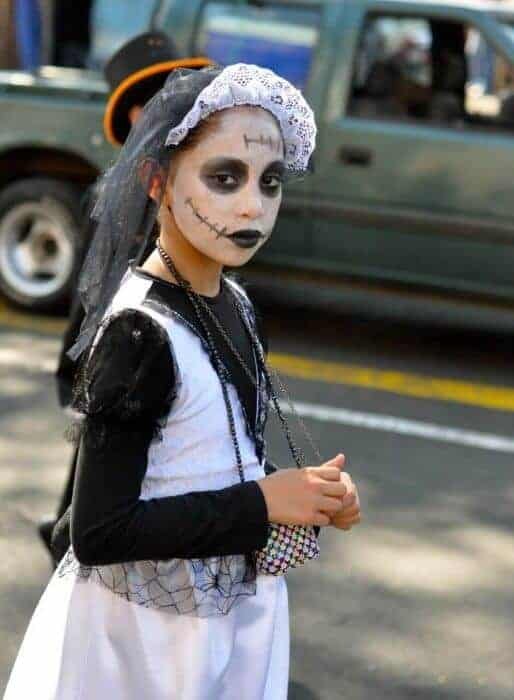 Love Mexico’s Dia de los Muertos tradition. One of the things I love about this holiday is the flirtatious and joyful aspects that are woven into the bridge between the present and the afterlife. The catrinas are fascinating. You captured the vibe perfectly. I had no idea that it was a week long affair. I love all the marigolds and in particular your first photo.It would be an interesting time to visit. I’ve always been fascinated by Mexico’s Day of the Dead celebration, and unfortunately have never been there when it is happening. I found your background info very interesting and your photos very good. We have been lucky enough to be in Mexico for several celebrations, but never Day of the Dead. We’ll have to make that happen sometime. I was just working on a Day of the Dead post Michele. You’ve covered it brilliantly and the photos are terrific. Only have experienced it from afar, would love to be there in person one day. Look forward to your additional coverage! Terrific article Michele! I’ve attended a few Day of the Dead parties but never knew the history behind it. I guess I need to make it to one of the festivals to really experience it. I love all the details and photos you provided. Fantastic job! Have always wanted to experience the Day of the Dead celebrations. Thanks for taking us along! I learned a lot reading this post. I wonder how the devout Catholic church-going residents respond to this celebration. Do they participate or shun it as a non-Christian event…or maybe they go along with it as a cultural celebration that is separate from church doctrine? Love the photos and time spent in preparing this post! Wow, what amazing photos – it really is an incredible celebration. I’d love to go to Mexico during this time. Very informative piece! I wish we observed Day of the Dead in the United States.